As the first leg of the new WGT Summer Tournament Series, World Golf Tour is running a special online tournament on Congressional Country Club this weekend only. 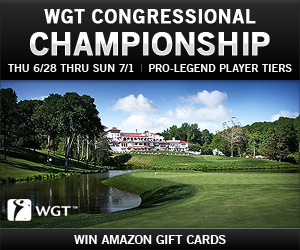 The WGT Congressional Championship is a free tournament for WGT players at the Pro thru Legend tiers so players can compete other players of similar ability. Players can play as often as they want from Thu 6/28 thru Sun 7/1 and post your best 18-hole score on Congressional. The top three scores in each Tier (Pro thru Legend) will all win Amazon Gift Cards: $100 first place, $50 second place, $25 third place. Check tournament rules for eligibility. Congressional Country Club was the host of the 2011 U.S. Open and this weekend is hosting the 2012 AT&T National event on the PGA Tour. The event benefits the Tiger Woods Foundation and honors military veterans with the support of the Wounded Warrior Project. And don't miss the action at the AT&T National this weekend on Golf Channel and NBC, as the tournament features host Tiger Woods, defending champion Nick Watney, as well as Jim Furyk, Dustin Johnson and other top PGA players. Learn more on Golf Channel. World Golf Tour has just launched a number of new features and improvements to our golf game based on the continued feedback from all our great players! 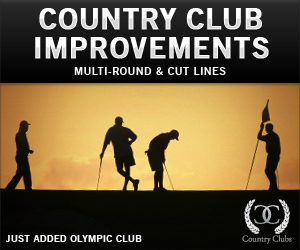 WGT Country Clubs can now set-up Multi-Round Tournaments and use Cut Lines in their private Country Club tournaments. There's also a new option for owners to email their club members...and, of course, an option for members to unsubscribe from those new Country Club emails if they want. Plus, Country Clubs can now set-up tournaments on The Olympic Club, site of the 2012 U.S. Open. If you're not in a Country Club, you're missing out on a popular way to always have online friends to play a game with, or to compete in private tournaments with just club members sharing the credit prizes. Create or join a Country Club today! 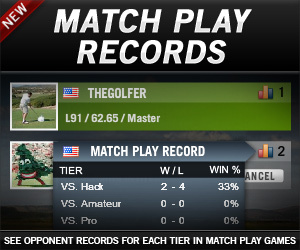 Multi-player Match Play Games are very popular on WGT. When you're joining a game, you have been able to see the Level, Tier and Average Score of the other player. However, we've also added their Match Play record statistics against players at every tier, to help you decide if it's going to be a fair match. 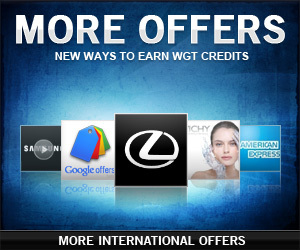 We've added even more ways to earn free WGT Credits, especially for players outside the United States. Check-out the new More Offers tab to see the new offers available in your country, including watching videos, online signups and shopping discounts. There are currently lots of new offers for players in Europe and other countries. 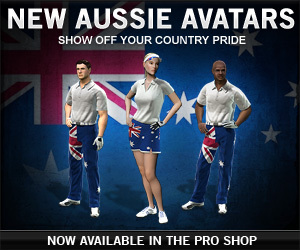 New Australian and Italian flag avatars join the existing American, Canadian and United Kingdom flag avatars. 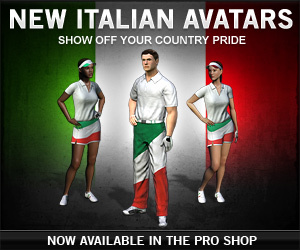 Show off your national pride with the new Oz and Italia male and female golfers in the Pro Shop. ...and stay tuned for a Facebook Poll to help WGT pick the next country avatars...France, Germany, Ireland, New Zealand, Scotland, South Africa...which country will be next? 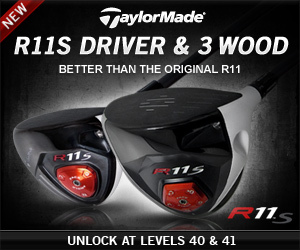 The latest R11S technology from TaylorMade hits longer than the original R11, and is now available to more WGT players, with the R11S Driver unlocking at Level 40, and the R11S 3 Wood unlocking at Level 41. 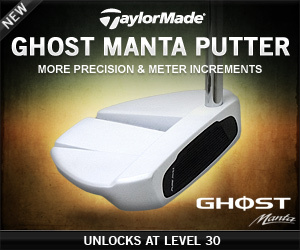 This beautiful new TaylorMade Ghost Manta Putter unlocks at Level 35 and offers more precision at a lower level, plus new Swing Meter increments (20, 40, 60, 80, 100, 300 feet) to help you select the right power to drain more putts. In the largest and most competitive Virtual U.S. Open ever, with over 2 million rounds played, it was StoneColdKiller who came from behind to post the low round 55 on Sunday evening to win by 2 shots over TheLighterDark. As the 2012 Virtual U.S. Open Champion, StoneColdKiller and a friend will be going to Merion next year to experience the 2013 U.S. Open as a special guest of the USGA. Congratulations! StoneColdKiller has been a WGT player since 2010. He's a Level 95 Legend with an average score of 58.77 and career earnings of $7,500. He's a member of the Deviations Country Club and also won the 2011 Virtual British Open, making him the first back-to-back winner of a WGT major championship. While the Deviations took top honors with places #1-3 and #6 with mrenn29, the other top spots are all from different WGT country clubs which are giving the Deviations a serious run for their money in these championships. Also, over $3,000 in Amazon Gift Cards were awarded to 15 WGT players who competed in special tiered tournaments for WGT NATION members for Pro thru Legend players. Thanks to everyone who played in this year's tournament, and don't miss the WGT Summer Tournament Series, featuring special tournaments on championship golf courses. Stay tuned on the WGT Tournaments page! 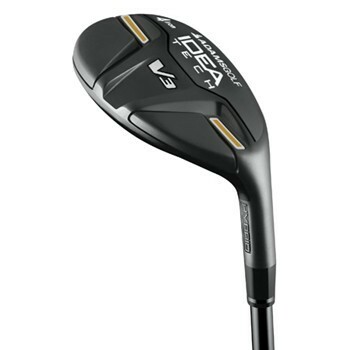 Today only, save over 50% on the Adams Idea Tech V3 Hybrid golf club for only $79.99 (suggested retail $199.99). Marc Leishman sat in the clubhouse for a couple of hours, wishing on the one hand, knowing on the other. He had, after all, shot 62 in the final round of the Travelers Championship and had the clubhouse lead a 14 under par. But he was certain that someone, anyone on the leaderboard would go at least one better before the day was out. One by one, the contenders dropped from the leaderboard, and at the end of the day Leishman’s total was good enough for his first PGA Tour victory. "I said to my caddie on the range this morning that we would probably have to get to 15 under to have a chance," Leishman said after the long wait. "When we finished at 14 (under), I was pretty confident it wouldn't be (enough). It's really a funny game." Not so funny to Charlie Hoffman, who had gotten to 16 under with five holes to play and had a two-shot lead on Leishman, three ahead of assorted others. But Hoffman, who has one PGA Tour victory, hit his tee shot in the water at the par-4 17th and made double-bogey. And he followed that with a bogey at the home hole to fall back to 13 under, one back of Leishman. Leishman, a 29-year-old Australian, finished 72 holes at 266 on the par-70 TPC River Highlands course just outside Hartford, Conn. Although the Travelers was Leishman's first PGA Tour victory, he is no stranger to winning. He has won four times worldwide, including three wins in Australia. And he has a victory on the Nationwide Tour. But to win on the big Tour, it took a big day. Leishman began Sunday's final round tied for 20th at 6 under. He went out in 5-under 30, including four birdies in a five-hole stretch, beginning at the par-4 second. He made back-to-back birdies at the par-5 13th and par-4 14th but didn't make birdie at the drivable par-4 15th. A birdie at the 17th capped off his 8-under round and started the long wait. A number of players had chances to catch Leishman but all came up short. Former champion and Masters winner Bubba Watson finished one shot back but only made one birdie on the final nine, that at the reachable 13th. Tim Clark was another shot back at 12 under but failed to birdie the 13th or the 15th and missed a short par putt at the 17th. And if Brian Davis had managed to make a couple of short putts that he missed coming home, he'd have his first PGA Tour victory. Instead, he made bogey at the par-5 13th and another at the 10th to finish two back of Leishman. We're now into Round 2 of the 2012 Virtual U.S. Open Championship on World Golf Tour, and the action is heating up! tinybo has maintained the top spot on the Leaderboard shooting 56-60 for a final 116 – just one shot ahead of the 2011 Champion, mrenn29, who shot 60-57 for 117.
tinybo represents the Carolina Sandhills Country Club and has a chance to bring home the cup, but there are still two very strong Deviations members, StoneColdKiller and TheLighterDark, at 57 who haven't posted their second rounds yet, and a 58 by either player could take the lead. Will 116 hold up? Watch the live WGT Leaderboard. Round 2 of this Championship Round is open through Sunday 6/24 for remaining players to post their final scores, for their chance to win a Grand Prize golf trip to next year's U.S. Open at Merion. Additionally we'll be announcing soon the winner of the second Grand Prize trip, to a lucky sweepstakes winner from the Qualifier Round. See prize details and country eligibility. Make sure to post those Round 2 scores and, as always, good luck! 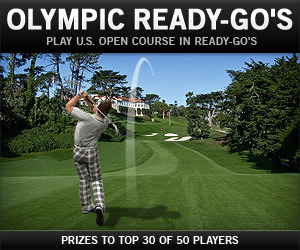 You can now play Ready-Go Tournaments on The Olympic Club golf course, host of the 2012 U.S. Open Championship, on World Golf Tour. Now running on Olympic are $1 Front 9 and $5 Full 18 Ready-Go's open to everyone, plus additional options for Pro thru Legend players only. Ready-Go's are fast virtual golf tournaments with entry fees ranging from $.50 to $10. They offer great chances to win with the top 30 of 50 players winning credits – and 6X credits for 1st place winners. The 2012 Virtual U.S. Open Championship Round is now being played on World Golf Tour. Round 1 is underway and qualified players can play and post their final score through Wednesday 6/20. With the Qualifier Round Cut Line at 57 there were 199 players who made the cut as of Sunday night, meaning they posted a score of 57 or better (including ties) in the qualifying round. But while 57 was the qualifying score, only two scores currently posted in the Championship Round are better than that. Unlike the Qualifier Round, this Championship round is single-play as opposed to unlimited play, adding more pressure to each shot and making it significantly harder to score well. Two Grand Prize trips to next year's U.S. Open at Merion will be awarded, one to a sweepstakes winner from the Qualifier and one to the final Champion. In addition, all 199 of the players who qualified for this Championship round will receive a USGA 1-year membership and U.S. Open hat. See prize details and country eligibility. The Championship Round 1 ends Wednesday 6/20, and then our champions put everything on the line in Round 2 which ends Sunday 6/24 as the final test of their skills. Good luck to all of the players! WGT President and Co-Founder, MisterWGT, was lucky enough to attend the 2012 U.S. Open at The Olympic Club this past weekend. He shares his thoughts and photos of his unique experience below. Enjoy! "In leaving... I took one last walk through the locker room. What a special place this Olympic Club. I cannot say enough how honored I was to be a part of it." Well my friends… what a week! The U.S. Open is now over and who would have ever predicted Webb Simpson hoisting the championship cup on the final green? I certainly didn't. Then again, it's become somewhat of a tradition for the U.S. Open to introduce to the world a new major winner. Think about it... Geoff Ogilvy, Lucas Glover, Angel Cabrera, Graeme McDowell... all first time champions. Heck, even Rory hadn't won a major prior to the U.S. Open last year! And what about the course itself? The Olympic Club's Lake Course, once again, challenged the legends only to see them come up one stroke short. Now Graeme McDowell and Jim Furyk have walked those same steps as Hogan, Palmer, Watson and Stewart… not only exhausted after ascending that hill from the 18th green to the clubhouse, but mentally and emotionally spent after battling those 72 holes. I was standing in the hallway of the clubhouse when Furyk's daughter greeted him after leaving the media room. He leaned down to hug her and she said, "Daddy, would you like me to get you an ice cream?" as she held her own. Jim's eyes were glassy and then his whole family leaned in for a group hug. Believe me, I thought about taking a picture of that moment… but that moment was theirs. He was spent. He could have had it… but alas, it wasn't meant to be. In the end, this week and this course holds a special place for me. I will admit, after spending so much time at Bethpage, St. Andrews, Kiawah or even the dramatic Wolf Creek… I didn't think Olympic would stand out. Sure, I loved the cypress pines and the elevation changes, but what else would make this place memorable? Little did I know that each hole would soon hold a new memory. It started with the first day of the shoot – aerial photography day – when the pilot literally quit while we were attempting to photograph the tricky doglegs of #04 and #05. I wanted the proper angle from the tee box to the fairway, but he absolutely did not like the proximity of the trees with the heli. Needless to say, I talked him into finishing. But when I watched Lee Westwood lose his ball on Sunday to the tree on #05… I was not at all surprised! I was trying to maneuver a helicopter around that very tree! One of the first holes we shot on the ground was #17. It was big, wide and even if we moved slowly with our new local crew, the golfers would never catch-up to us. Little did we know, mother nature had a different schedule. We finished half the hole when suddenly the California sun vanished into London fog. So we stopped and waited. And waited. And waited. "Oh well, let's just wrap & clean-up," I radioed to our producer. But then the weather turned on a dime and again the skies were clear. Only now… golfers were on #15! LET THE RACE BEGIN! The crew went from relaxed and training on the job into full attack mode. It was a great effort from the team and it set the pace for the rest of the shoot. Fast-forward to Friday's Round 2… watching Tiger, Phil & Bubba play #17, it was almost refreshing to see this "easy birdie hole" show golf's biggest names it's pesky little personality. Although it's time to look ahead, I am still in denial this U.S. Open has come to an end. Watching this course test these guys, being in the midst of all these past, present & future champions… to be perfectly honest, I was rooting for a playoff round on Monday! I simply loved it. I cannot thank the USGA and The Olympic Club enough for granting us this privilege to share this course with the world. I hope you all enjoy it as much as I have. Come to think of it... I think I'll enjoy another virtual round. Care to join? Woods is done for the day. Not his week. Not his major. I had lunch with Matt Kuchar! What a great guy... all smiles coming off his Sunday round. After his performance at Augusta, he's ready to win a major. Furyk explains what happened on #16. I got goosebumps standing on the green... and I was only holding an iPhone! Notice Simpson's stretch from #07 - #10. Brilliant golf there & the true reason he won. Webb Simpson said he had "a peace all day" Sunday. Now he owns a large piece of golf history. 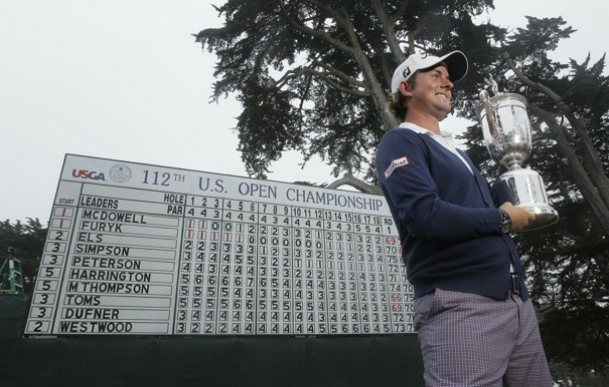 By scorching a nails-tough Olympic Club layout with a pair of weekend 68s, the 26-year-old Wake Forest grad from Charlotte, N.C., won the 112th U.S. Open by a shot ahead of little-known American Michael Thompson and Northern Ireland's Graeme McDowell, the 2010 U.S. Open champion. "One of my thoughts on the back nine," Simpson said, "was 'I don't know how Tiger's won 14 of these things.' "
But an important part of the "peace" he mentioned clearly came from swing work he had done after missing the cut at The Memorial in May, his last start. Then, last week, Simpson went on a buddy’s golf trip to Pinehurst to clear his mind in advance of the Open. In the end, McDowell needed a 25-footer to force an 18-hole Monday playoff on the 72nd hole and missed it left. Third-round leader Jim Furyk, playing in the final pairing with McDowell, also arrived at the final hole needing a birdie to tie Simpson. He bunkered his second and made bogey to drop into a five-way tie for fourth with David Toms, Padraig Harrington, John Peterson and Jason Dufner. "Nerve-wracking," said Simpson when asked what it was like watching McDowell and Furyk on their final hole. Playing in his second U.S. Open, Simpson became the 15th different player to win in the past 15 majors. Furyk held at least a share of the lead throughout the final round until he snap-hooked a drive on the par-5 16th and had to settle for a bogey that dropped him one behind the charging Simpson, whose four birdies in a five-hole stretch in the middle of his Sunday proved to be the difference. "This course," Simpson said of Olympic, "is so hard." The tipoff on how difficult Olympic was going to play last week came Thursday afternoon when the grouping of Luke Donald, defending champion Rory McIlroy, and Westwood combined to shoot 19-over par. Donald, McIlroy and Westwood are the Nos. 1, 2, and 3 players in the world rankings, respectively. Neither Donald nor McIlroy survived the cut that came at 8 over par. "There's an 80 lurking," said Masters champion Bubba Watson, who opened with a 78 and also missed the weekend. The usual player carping was mostly muted. But there was enough to elicit a rare non-conciliatory response from USGA executive director Mike Davis. "We made it very clear," Davis said in a moment of frustration. "Some don't like it, I guess they can tune out by this week or not file an entry if you're a player." Earlier, Davis had described the purposed inconsistency of the lies in the rough as being a "little bit like an Easter egg contest." Davis also went the extra mile during a post-round TV interview between Simpson and announcer Bob Costas. When an interloper attempted to run into NBC's shot, Davis grabbed him and yanked out of the camera's reach. Later, McDowell said he enjoys tough tests. But, he added, "I'm not sure you can have your 'A' game on this course. It’s just impossible. It beats you up." Tiger Woods looked for all the world like a winner the first two days and was tied with Furyk after 36 holes. Alas for him, his driver, iron game, and putter deserted him Saturday on the way to a 75. When he bogeyed the first two holes and doubled the third Sunday his bid to join Bobby Jones, Jack Nicklaus, and Willie Anderson this year as the only men to have won four U.S. Opens died aborning. Woods closed with a 73 and a 7-over total of 287. It was good for a tie for 21st. Phil Mickelson celebrated his 42nd birthday Saturday and little else at the major championship he still hasn't won. His 72-hole total of 296 was a whopping 16-over par and left him tied for 65th. The feel good story of the week was the performance of 17-year-old amateur American Beau Hossler. Just four shots back of the leaders after 54 holes, Hossler hung on with a Sunday 76 to gain second-low amateur honors. Jordan Spieth was low amateur. In the end, there was the wait. "I did not want to play in a playoff for a lot of reasons," said Simpson, who watched in the locker room with his wife, Dowd, as the final drama unfolded. All he really wanted to do this year, he said, was to continue to get better. "I don’t care if I make a million dollars as long as I keep getting better," he said. Better, for now, for Webb Simpson, is best.